The rise of Trump and Brexit has reminded that we are never too far away from the politics of extremes. But these sorts of trends are nothing new, argue Jon X. Eguia (left) and Francesco Giovannoni (right). Looking back to the Republican Party of the 1960s, they write that a political party that faces poor public opinion can improve its fortunes by dramatically reinventing itself and proposing a radical alternative to voters. Political extremism seems to have spread to both sides of the Atlantic with both the UK parliament and US Congress currently deadlocked over issues which were hardly on the political radar a decade ago. In London, politicians are paralyzed by the debate over Brexit, and in Washington DC the government remains shuttered because of a president’s desire to see a giant wall constructed at the US- Mexico border. But what leads a political party to take such extreme measures to gain or keep a hold on power? The rise of radical extremism in a democracy can take at least two forms: either one or more fringe extremist parties gain prominence, or a large mainstream party shifts position to embrace radical policies. We argue that a mainstream party embraces radicalism when its reputation for competence at running the government in a standard way is very low. A recent example of this phenomenon is the leftward lurch of the UK Labour Party in 2015, when it elected Jeremy Corbyn as party leader. The best historical example is the US Republican Party in 1964, when the party embraced unabashedly conservative values under Senator Barry Goldwater. Consider a country like the US, or the UK, with two main parties, which are both normally associated with mainstream platforms and policy proposals. Suppose that at a particular point in time, one of the two parties enjoys an advantage over the other: the party is believed by the public to be better able to deliver mainstream, orthodox policies, and to execute them competently. Then, the party with the weaker reputation has a choice to make. One possibility is to continue following the conventional wisdom and to keep steady on a mainstream platform, where it is unlikely to win elections, given its battered reputation. A second option is tactical extremism. That is, to move away from the centre, by investing on an alternative that is radically different, and developing credible proposals of the highest-possible quality around this novel alternative. Tactical extremism is a somewhat desperate choice for a party: moving toward the political wilderness of extremism further reduces the party’s chances of winning elections in the short term. However, for a party with a battered reputation, it might be best to accept this short-term loss to reinvent itself while in opposition, to better prepare for future elections. The gamble is that while the party sits in opposition polishing radical alternatives, something will go wrong for the mainstream government, and voters will be fed-up and demand a change of policy. If voters do lose faith in the mainstream wisdom and decide that it is time for a new perspective, then tactical extremism pays off: the party that had invested in a radical alternative is best positioned to credibly deliver the change that voters now seek. This was the gamble taken by the base of the Republican Party in the 1960s and while it failed initially, it paid off exceedingly well for the party in the long run. The 1950s represented a period in which the United States’ public opinion supported interventionist economic policies: the twin successes of the New Deal in overcoming the Great Depression, and of the huge state effort to win World War II, had rendered the old non-interventionist ideology of the pre-Depression Republican Party seemingly obsolete. The Republican party platform, starting with Governor Dewey of New York and continuing with President Eisenhower, acquiesced to this new reality and no longer fought the building of a welfare state.But this position proved difficult for the Republican party, because if electoral competition revolved around which party was better at delivering large government programs, voters tended to trust more the Democratic party. After all, the Democrats had started and championed these programs, whereas the GOP had only reluctantly acquiesced to them. Except for Eisenhower’s (re)election in 1956, towards the late 1950s, the Republican Party started to accumulate electoral defeats. The party lost midterm elections in 1954 (in which Republicans lost their majority in the Senate), 1958, and 1962, and lost the 1960 presidential election. By 1963, the Democratic Party held the Presidency, a majority of 258 to 176 in the House of Representatives, and a veto-proof majority of 68 to 32 in the Senate. After their 1964 defeat, Republicans started to turn the electoral tide, and to win elections at all levels under conservative manifestos. What was previously considered extremist had started to become more mainstream: after Goldwater’s defeat, the number of voters who considered themselves liberals dropped by 25 percent, and has since never recovered. Conservatives turned Congressional and Gubernatorial seats in subsequent elections. Ronald Reagan went from campaigning for Goldwater in 1964, to become Governor of California in 1966. With his victory in the 1980 Presidential election, the conservative movement finally managed to win the highest prize, and conservativism has been at the heart of every national GOP platform since 1980. This blog post is based on the authors’ paper Tactical Extremism, forthcoming in the American Political Science Review. This article was originally published on The LSE US Centre’s daily blog on American Politics and Policy. 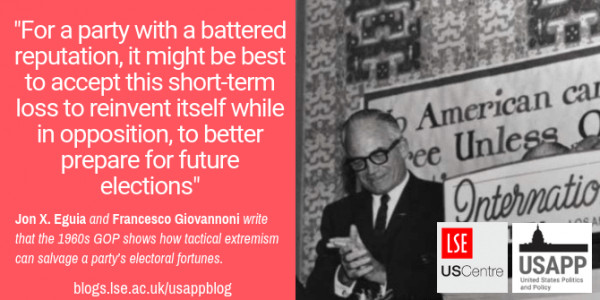 This entry was posted in Global political economy and tagged Barry Goldwater, brexit, Donald Trump, GOP, Republican Party, tactical extremism by policybristol. Bookmark the permalink.